I recently came across an article in The Atlantic that tells of a remarkable man named Billy Barr. His claim to fame is his outsize impact on climate science. Thanks to his effort, scientists now have a deeper understanding of the effect of climate changes on the Rocky Mountains and other similar alpine environments. Yet he is not a scientist. He certainly did not set out to go to the Rocky Mountains to become a scientist. The article in The Atlantic is about his remarkable life story. Here’s a video from the National Geographic about Billy Barr. In the last couple of decades, small but perceptible changes in the high alpine environments had caught the attention of climate scientists. For example, spring snow seemed to melt a little earlier. The flowers blossomed a little sooner. However, they could not make much sense of the changes without a historical context. Without historical data, scientists would not know whether the recently observed patterns were due to random fluctuations or actually represented a clear break from the past. Barr had made Gothic Mountain in Colorado his home in 1973. Billy Barr did not move from the East Coast to the Rocky Mountains to become a scientist. He went there to find inner peace. He started data recording in his first year there partly as a way to combat boredom and partly to have a point of reference for future winters. He measured snow levels, animal tracks, and in springs the waking of hibernating animals and first joyful calls of bird returning. He filled one notebook, then another and has been doing so continuously for 44 years! Luckily for climate science, Billy Barr lives very close to the Rocky Mountain Biological Laboratory (RMBL). He became a volunteer there early on in his time in the mountain as a caretaker and later keeping track of expenses as an accountant. Amazingly the scientists did not know about his data collection habit until late in the 1990s! Once the scientists at RMBL found out, they realized Billy Barr’s data was a priceless trove of data that could help them make sense of the warming trends in the world. Billy Barr’s data are the basis for dozens of research papers on climate science. His data on the high alpine environment has provided an unexpected glimpse into a prior world that scientists never recorded. His notebooks were filled with data on first and last snow, the snowpack levels in between, and when hibernating animals wake and when the birds return after winters. What is the problem with earlier snow melt and earlier flower blossom? The answer is that such seemingly small changes result in seasonal imbalance in the alpine environment (also called phonological mismatch). A concrete example is the broad-tailed hummingbird. The hummingbird relies on nectar from the glacier lily. Barr had tracked the hummingbird’s return each spring and the first blossoms of the glacier lily. In the past the return of the hummingbird and the blossom of glacier lily were in sync. The glacier lily now flowers 17 days earlier than 40 years ago. If the same warming trends continue, it is likely the broad-tailed hummingbird will completely miss the nectar of the glacier lily, thus spelling the doom for the bird. What happen to the broad-tailed hummingbird will set off a negative chain reaction for butterflies, bees, hibernating mammals, and the other animals that depend on them. The example of the broad-tailed hummingbird suggests that the ecosystem in the alpine environments might be rapidly approaching a tipping where a small change in the system can result in a drastic change overall. The snowpack in the Rocky Mountains quenches the thirst in the cities in the surrounding regions. Forty million people rely on the Colorado River for water. Not surprisingly, Barr’s data helps shape water policy for Southwestern region of the United States. For example, hydrologist Rosemary Carroll used Barr’s snowpack data and other sources to model groundwater flows to the Colorado River. Billy Barr is a fascinating story. For a fuller story, read the Atlantic article or view the National Geographic video. Or you can Google Billy Barr. What is the topologist’s sine curve? Why is this curve attributed to topologists? If you Google Topologist’s Sine Curve, Evelyn Lamb’s article pops up, which does an excellent job of explaining the intuitive idea behind the topologist’s sine curve and why it is an interesting object to mathematicians (this is the link). This is an article she wrote for Scientific American. I chanced upon the article recently. That reminded me of an article I wrote on the topologist’s sine curve in my topology blog (my article). I will not try to explain too much here, except to say that the topologist’s sine curve is good example of a connected space that is not path connected. Unlike many descriptions of the topologist’s sine curve, the topologist’s sine curve in my article does not use the function . My topologist’s sine curve is boxy. There are actually more than one curve. The following are two diagrams from my article. Figure 3 is the closed topologist’s sine curve (closed because it has the vertical bar at the left). This curve is identical (topologically speaking) to the plus the vertical bar at the left. In my opinion, the boxy version is better in some way. This curve is constructed by an iterative process (please see Figure 1 and Figure 2 in my article). As a result, the boxy curve brings out the essential idea more clearly – the curve is connected and yet not path connected. The whole curve is connected. Yet you cannot get from the right edge to the left edge. Figure 4 is the extended topologist’s sine curve, which has an additional bar at the bottom. The bar at the bottom makes it path connected. You can now go from any point in the curve to the vertical bar at the left side. Please feel free to read any or all of these articles. Evelyn Lamb’s article also has links to other pieces that she wrote on other interesting mathematical objects (Mobius strip is one). There is an surprising and interesting mathematical story from China. At the center of the story is a migrant worker in China named Yu Jianchun who is generating excitement and awe because of his work in complex and esoteric math problems despite having received no university education, much less formal mathematical training. Facts about the story are still scanty. But he is attracting a lot of attention from academics and from the general public in China and internationally. Here is an article from CNN about Yu. Many people are seeing a parallel between Yu and the character Will Hunting in the Oscar-winning movie “Good Will Hunting”. After studying at a vocational school, Yu Jianchun became a migrant worker going from place to place working as a parcel delivery man. He always has a passion for mathematics and he spends almost all of his spare time studying it. He is also persistent (and probably stubborn as well). He has spent 8 years working on the problem that currently garners him national and international attention. Whenever he found work in a new city, he always seek out the mathematics professors at the local university in hope of finding confirmation for his math work. He was ignored until a math professor at Zhejiang University, Cai Tianxin, invited Yu in June 2016 to present his math work at a seminar. The math work of Yu that is generating buzz involves Carmichael numbers, which are odd integers that are prime-like (the usual term is pseudoprimes). For both theoretical and practical reasons, it is critical to test whether a given large odd integer is a prime number. Carmichael numbers are integers that are not prime but yet pass the Fermat’s test for prime numbers. So being able to weed out the Carmichael numbers from the prime numbers will be critical. Testing whether a number is a prime number is more than an intellectual curiosity. Prime numbers are the back bones of encryption systems such as the RSA algorithm, which makes online shopping safe and secure. So the study of prime numbers and Carmichael numbers has implications for information security. Carmichael numbers are named after R. D. Carmichael who discovered 15 such numbers in 1910. These numbers are very rare. For example, of all the numbers that are less than one billion, there are only 646 Carmichael numbers. In contrast, there are 50,847,534 (over 50 millions) prime numbers below one billion. R. D. Carmichael conjectured that the number of Carmichael numbers is infinite. It was finally proven in 1994 that there are infinitely many such numbers, i.e. there is no upper bound on Carmichael numbers. No matter how big the whole number , it is proven that there is always a Carmichael number larger than . What is special about Yu’s work is that he has discovered a new way to identify Carmichael numbers that is different from the classic algorithm. However, there has not been any precise mathematical statement on what Yu’s results are. So it is hard to get a sense of how special or how significant his results are. In the CNN article referenced above, William Banks, a mathematician who works with Carmichael numbers, seemed to indicate that Yu’s results are about formulas that can generate Carmichael numbers. Yet the same CNN article also indicated that Yu’s work is about an alternative method to verify Carmichael numbers. Is it a new formula for generating Carmichael numbers or is it a new test to check whether a given number is a Carmichael number? It is likely that Yu’s results are currently being verified. Cai Tianxin, the math professor at Zhejiang University who invited Yu to give a talk, plans to publish Yu’s theory in a book on Carmichael numbers. So in time we will have a better sense of Yu’s achievement. Another refreshing point about the story of Yu Jianchun is that Carmichael numbers are in the news! Occasionally prime numbers are in the news. For example, when someone finds a new largest prime number or when someone proves a long standing problem about prime numbers. But rarely do we see Carmichael numbers being mentioned by the major news outlets. It is hard for me to comment on Yu’s work on Carmichael numbers since details are not available. However, Carmichael numbers are an interesting concept in number theory. Here’s an introduction to Carmichael numbers. Here’s an article on how to use Fermat’s test for prime numbers. Here’s another discussion on Carmichael numbers. Finally, here’s another discussion on Fermat’s test. Just came across news of the discovery of a new pentagonal shape that can tile the plane. Tiling the plane means that you can cover a flat surface using only identical copies of the same shape leaving neither gaps nor overlaps. It is known that any triangle can tile the plane, as does every quadrilateral (a four-sided shape). 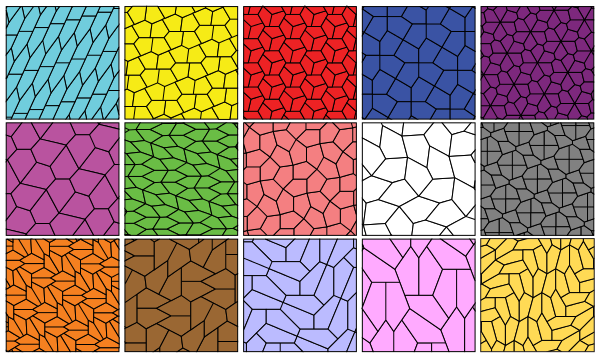 Tiling using (convex) pentagonal shapes is an interesting problem whose history goes all the way back to 1918. Prior to the latest discovery, there were only 14 distinct tiling patterns. This newly discovered pentagonal tiling is the first discovery since 1985. The three mathematicians who discovered this new pattern are Casey Mann, Jennifer McLoud and David Von Derau of the University of Washington at Bothell. They made the discovery after an exhaustive computer search through a large but finite set of possibilities. No one know if there are more distinct pentagonal shapes that can tile the plane. This piece from the Guardian gives a good background to this problem. You can find a picture of the new pentagonal tiling in the above piece or this piece from npr.org or this piece from a design company. The following is a picture of the 15 distinct pentagonal tiling patterns (the new one is on the bottom right). I just came across an article in New York Times about the famous mathematician Terry Tao, who, a one-time math prodigy turned Fields medalist, is a prolific researcher working in diverse areas of mathematics. The title of the article is “The Singular Mind of Terry Tao”. Here is the article. With Terry Tao being a one of the greatest minds in 21st century mathematics, I know this would be an interesting read. Indeed, it gives a vivid picture of the world of Terry Tao – a prolific mathematician producing important work, a former child prodigy, a husband, father and so on. It turns out that it is also a gentle introduction of various math concepts. For example, the article has a great short introduction of prime numbers that gives readers a sense that prime numbers are a simple construct that arises out of a concept of numbers and the four arithmetic operations (addition, subtraction, multiplication, and division). Knowing these basic number concepts is all you need to spot the prime numbers. Thus prime numbers are elemental objects in mathematics. It goes on to say that any alien species in other parts of the universe is probably very different from us but “we can be almost certain that their mathematicians have discovered the primes and puzzled over them”. It also points out that “scientists have uncovered deep connections between primes and quantum mechanics that remain unexplained”. The short intro to prime numbers is to lead the readers to the discussion of the Green-Tao Theorem, which led to the award of the Fields medal for Terry Tao. Another interesting thing about the article is that it gives the readers a sense of what it means to do mathematics. It is not a static pursuit of solving algebra problems from stale old math books. In fact, “The ancient art of mathematics, Tao has discovered, does not reward speed so much as patience, cunning and, perhaps most surprising of all, the sort of gift for collaboration and improvisation that characterizes the best jazz musicians”. Mathematical research is a fundamentally creative act. It is a very difficult pursuit. It is akin to a struggle with the devil (as the article playfully suggests). Mathematics research is a long game. Doing math research requires courage; it may take weeks, months and years if success comes at all. Another interesting tidbit of information is the letter of recommendation written by Paul Erdos, the revered Hungarian mathematician, in supporting Terry Tao’s application to Princeton. Based on what we know of Tao, Erdos’ prediction is spot on. The full article is here. Math is in the news again. It’s not about the solution of a century old math problem. It is not about the math behind an earth shaking new technology. This time the focus is on the humble basic math skills such as how to calculate the price of a sofa in a clearance sale or how to calculate the earned interest in a savings account. The math news that is in the spotlight points to a tantalizing possibility that if enough people could practice this kind of simple basic math, the deep global recession that occurred a few years ago might have been averted, or its impact might have been greatly reduced. According to a new study published in the National Academy of Sciences, there is a strong negative correlation between basic math and quantitative skills and the likelihood of defaulting on a subprime mortgage. In other words, borrowers with lower math skills are much more likely to default on their loans and borrowers with higher math skills are much less likely to default on their loans. It is well known that a massive increase in the volume of subprime mortgage defaults in years 2006 and 2007 helped push the economy into a deep global recession in 2008. The study is based on data from subprime mortgages originated in 2006 and 2007 in greater New England area as well as data from a phone survey involving 339 holders of these subprime mortgages. The phone interviews assessed the numerical ability, financial literacy, verbal skills and cognitive ability of the 339 participants. Numerical ability in the study refers to the proficiency of a borrower for solving basic mathematical calculations. One of the results of the study is that the numerical ability is a strong predictor of which borrowers will be more likely to be delinquent in loan payments or to be foreclosed upon (the lower the numerical ability, the higher the likelihood of default). “Our analysis raises the possibility that limitations in numerical ability may have significantly contributed to the massive amount of defaults on subprime mortgages in the recent financial crisis,” concluded the researchers of the study. Could it be that the loan delinquency of the participants of the phone survey was due to other factors such as income, education and credit scores? For example, could the results of the study be due to the low credit scores of the participants? If the participants of the study had defaulted prior to the study, they would be more likely to default again. After the researchers of the study adjusted for these factors, the connection between poor math skills and higher default rates remain the same. As a result, the researchers concluded that it is likely the effect of the math skills that is driving the results and not the credit scores and other factors. The researchers of the study also did not find any significant connection between the poor math skills and the types of mortgage loans among the participants of the study. The correlation between poor math skills and higher loan delinquency is present across all the loan types. So it is not that the borrowers in default happened to choose risky loan types such as adjustable mortgages or negative amortization mortgages. So the study suggests that restricting these risky types of mortgages may not prevent future mortgage default epidemics. In a sale, a shop is selling all items at half price. Before the sale, a sofa costs $300. How much will it cost in the sale? If the chance of getting a disease is 10 per cent, how many people out of 1,000 would be expected to get the disease? A second hand car dealer is selling a car for $6,000. This is two-thirds of what it cost new. How much did the car cost new? If 5 people all have the winning numbers in the lottery and the prize is $2 million, how much will each of them get? Let’s say you have $200 in a savings account. The account earns ten per cent interest per year. How much will you have in the account at the end of two years? We know math is useful. In fact, this study provides empirical evidence that math pays. Having proficient level of math and quantitative skills can lead to favorable and optimal financial outcome in a person’s life. Having good number skills can help any person makes better financial decisions and better manage his or her financial affairs. At least, having good quantitative skills can help avoid costly financial dislocation that comes from defaulting on mortgages, as the study suggests. The authors of the research study also indicated that their “results indicate possibly large benefits from increased financial education of homeowners.” Certainly, greater emphasis in financial education (and quantitative skills) in high school can have a positive effect on financial outcomes later in life. Our view is that we do not need to wait for school reform to take place. We can make changes at the individual level. The above five questions are not math problems that can only be taught in school. These are problems that we encounter in our daily life. So in order to improve on quantitative skills, we do not necessarily need to go back to school to take a course in finance. We can improve on quantitative skills one purchase at a time and one bank transaction at a time. Come up with a right question. Then take out a calculator and a notepad and try to resolve the issue that is at hand. Some students cannot wait for schooling to be over so that they don’t have to deal with math any more. This jaundiced view of math is unfortunate. There is school math and there is math in everyday life. This study published in the National Academy of Sciences shows that it pays to have skills in the latter. Here’s a few news outlets that reported on the same study. This is the study published in the National Academy of Sciences. If you Google the name of “Yitang Zhang” recently, you will find many entries with keywords such as “twin primes”, “twin prime conjecture”, “bounded gaps between primes”, along with “University of New Hampshire”. Here’s three of the entries: UNH professor solves ancient mathematics riddle; UNH lecturer stuns the math world; The Beauty of Bounded Gaps. Here’s a piece from New York Times: Solving a Riddle of Primes. The reason for all this attention from the mainstream media that normally don’t pay attention to math? Mr. Zhang made a huge breakthrough toward solving an ancient problem about prime numbers. This is a brief account of his achievement. A pair of prime numbers are twin primes if they differ by 2, for examples, 3 and 5, 5 and 7, 11 and 13, 17 and 19 and so on. The Greek mathematician Euclid gave the oldest known proof that there are infinitely many prime numbers around 300 BC. Euclid also conjectured that there are infinitely many pairs of twin primes. The statement that there are infinitely many pairs of twin primes is called the Twin Prime Conjecture. Note that the Twin Prime Conjecture is saying that there are infinitely many pairs of primes such that the gap within each pair is exactly 2. Many great mathematical minds since ancient time had been trying to prove this conjecture but to no avail. But there were incremental progress throughout the twentieth century and in the first decade of the new century. Mr. Yitang Zhang did not prove the Twin Prime Conjecture. He proved that there are infinitely many pairs of prime numbers such that the gap within each pair is bounded is at most 70,000,000 (70 millions). In other words, Mr. Yitang Zhang proved the Bounded Gaps Conjecture. The gap of 70 million seems like a large number and may not seem all that significant to non-mathematicians. Now that there is now a proof that the gaps between pairs of primes do not have to increase without bound (as some mathematicians had suspected), mathematicians can work on narrowing the gaps (may be even reducing the gaps down to 2). Indeed, since the announcement of Mr. Yitang Zhang’s result in May, some mathematicians had narrowed the gaps down to mere millions (in one case down to hundreds of thousands)! His achievement is even more impressive considering the background of Mr. Yitang Zhang. Mr. Zhang did earn a PhD in mathematics in 1991 from Purdue University. In the tough academic job market after graduation, he could not find any academic position. He worked as an accountant for a period. He even made sandwiches at a Subway shop at one point. He is currently a part-time math lecturer at the University of New Hampshire, a nice school for sure, but far from the elite club of mathematicians working at places like Harvard, Princeton and Stanford. Some people have this notion that monumental math problems such as the Twin Prime Conjecture are the domain of young math whiz. Mr. Zhang is over the age of 50. Another handicap for Mr. Zhang is that he is not in the math specialty of number theory, which would be the specialty of the mathematicians who work on problems like Twin Prime Conjecture. The last academic publication of Mr. Yitang Zhang is from the year 2001. So he is considered an inactive researcher by many in the math community. Given his background, no one in the math community expects great results from Mr. Yitang Zhang. Apparently he was oblivious of his supposedly “handicaps”. He certainly did not make any excuses for himself. He just kept plugging away, building upon the advances made by other mathematicians. The story of Yitang Zhang is remarkable in two fronts. One is his mathematical work. The other is the human dimension of the story, which makes his achievement all the more remarkable. Mr. Yitang Zhang is an inspiration to us all. More information about Yitang Zhang can be found on the Internet. Here’s a few more entries from an Internet search. Wikipedia’s entry on Yitang Zhang. The research paper that has Yitang Zhang’s results (you need to be a subscriber to see the paper). The research paper that has Yitang Zhang’s results (free access). A math blog that explains Yitang Zhang’s results (for people who know number theory).